ARC's Technology Concepts for Industry are enabling industrial organizations to improve operational performance and shareholder value. ARC's Asset Lifecycle Management Concept offers a new, richer vision for asset lifecycle management that clarifies its role in organization and identifies the key processes and stakeholders. Capital assets are costly and long-lived. ARC's research on Asset Performance Management provides a framework for organizations to analyze their asset management needs, develop effective strategies, and get the most out of all of their assets. Industrial Internet of Things (IIoT) allows organizations to move from manual inspections to automated systems to collect data. ARC's APM 2.0 Maturity Model helps you best leverage IIoT to improve your organization’s operating performance. 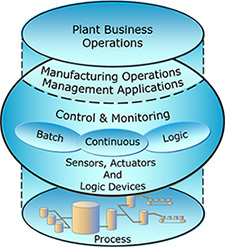 Manufacturing executives must carefully balance and optimize the performance of all plant processes and systems. In order to think through what it means to be a Real-time Enterprise, it helps to have a robust model of the manufacturing enterprise. ARC introduced the Collaborative Management Model for this reason, and it has gained broad acceptance. Collaborative Process Automation System or CPAS is our vision of future process control systems. ARC introduced the CPAS concept in 2002 in response to requests from several large end user clients that were having difficulty evaluating the capabilities of the current Distributed Control Systems (DCS) to meet their evolving business requirements. In order to meet these evolving process automation requirements, ARC analysts first established a set of guiding principles to develop our vision. We used these guiding principles to create the functional requirements, architecture, and technology choices. In the coming decade, new trends will push manufacturers to improve collaboration significantly across the entire value network ecosystem. ARC's CVN Concept helps all parties to collaborate seamlessly. ARC's Cybersecurity Maturity Model structures cybersecurity defenses into understandable steps and highlights the costs and resources required for each step. Managers can use the model to assess their current situation, focus staff efforts, and evaluate the full implications of additional funding requests. ARC's Industrial Internet of Things (IoT) concept can help you understand and incorporate the latest IoT-related developments and best practices into your company's asset and product lifecycle management strategy. This ARC concept introduces the Information-Driven Enterprise strategy and provides a framework for industrial companies to use to determine how to best approach technology decisions. Operational Excellence is a rational process for achieving competitive advantage. OpX Drives the enterprise to "Consistently Do the Right Things Well". Reduce risk, reduce costs, reduce project cycle time - these are key mandates for everyone involved in capital projects. Mega-projects, JVs, tight capital, fluctuating material costs, and aging workforce make projects more difficult to manage. RPM extends Operational Excellence (OpX) by continuously identifying the goals and targets that will ensure success. RPM integrates real-time visibility, agility, and speed into the performance management system.